When I travel as a tourist (or, as a "visitor", as I prefer to think of it) I stay with the locals, in a local dive, where English is rarely if ever spoken. When I travel as for business, at least in the "lower 48", I stay at the Courtyard by Marriott chain. They're small, well-designed, cozy, clean, have a great breakfast buffet, late-night room- and/or restaurant- service service, and a friendly staff. For the first part of the time I was travelling each week to Phoenix I stayed at the Courtyard in Mesa, in an area of town which was just being built up. I'd leave the Phoenix Sky Harbor Airport and head down the highway until I saw the Bank of America building in the distance (above). Then I'd take that exit, cross over the highway, and head down one block to the building. A right turn, past the empty field (below), and another right into the hotel entrance. Another stay had begun. This is one of the regular rooms at the Courtyard. From time to time, when the four suites are unbooked for the week I'm there, the staff will upgrade me to the more desireable spacious two-room alternative. I usually use the bed closest to the desk and windows for sleeping, the other as a huge shelf for my suitcase, etc. I usually am given a room on the second floor; I'm under the impression that there security problems on the first floor, what with folks leaving their sliding glass windows open. 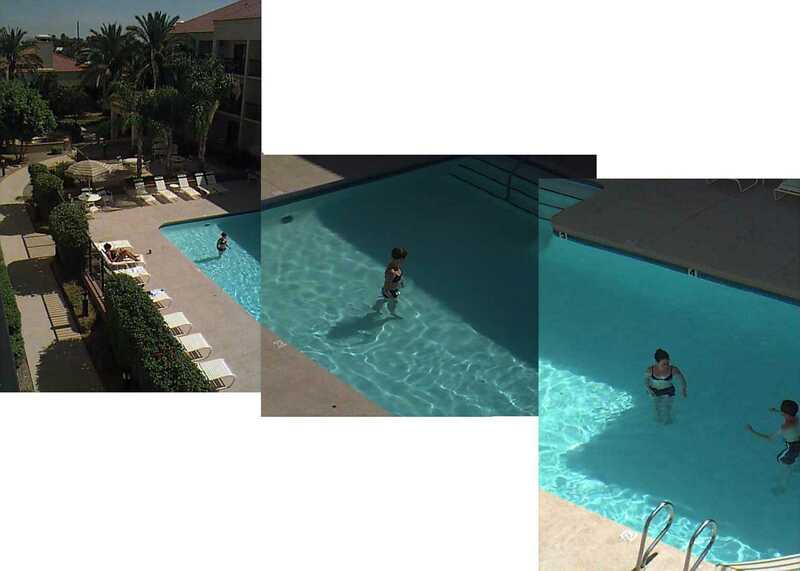 Here's my view of the pool in the middle of the courtyard. It's often so hot in Phoenix - I've enjoyed 114 F days - that it's too hot to be in the sun by the pool. Amazing, isn't it? But it is a dry heat, and I really don't mind it much. A liter of drinking water makes everything much more comfortable. Well, there you have the bare bones of my time in the Phoenix area. There's much more to tell, things like the café down the street which has a wonderful outdoor misting system, or the wonderful seafood restaurant in the middle of the desert (the Salt Cellar), but I'll close with this picture taken from the window of my plane. It was a Friday, and I was trying to fly home to San Francisco, and there was massive storm coming into Phoenix. It was threatening to close the Sky Harbor Airport, but we took off at the last minute, saving me from being trapped away from Rose for the weekend. Next Monday? Back to Phoenix.